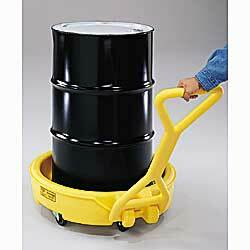 Safely contains liquids from leaky 30-, 55-, and 95-gallon drums. 12-gallon sump capacity; 1,375-lb. load-bearing capacity. Rust- and corrosion-resistant polyethylene construction. Include: poly push/pull handle and 5 swivel casters. 31-3/4" inside dia., 35-3/4" dia. x 9-1/2"H overall.